This book's title may suggest that Geoffrey Boycott could be involved. He isn't unless he was a commentator at the 1992 World Cup final which is essentially the moment in which Nihar Suthar's book starts. The climax of the fifth World Cup ended with Pakistan winning their first and, to date, only World Cup, in Australia. People may remember this match also for another lost opportunity for England as well as realising the dream of Pakistan's victorious captain, Imran Khan, of building a hospital. What probably won't be known is that it was the day when some young Afghani refugees living in squalor in a refugee camp in Pakistan first watched a game of cricket and made it their dream one day to take their country, at that stage, a non-cricket-playing nation, to the World Cup. With little if anything known about the sport in their home country, certainly no facilities or even equipment, having to convince their parents that a sport which they were unaware of was where their future destiny lay, it would have looked like at best a childhood dream and a completely futile gesture. Their aim was to bring happiness to their country folk and show that the tag of being tarred as villains was unjust. This is how the remarkable story of Afghanistan cricket began: twenty-three years later they had achieved it and, but for one setback and a major one at that, it might have been realised after nineteen. Nihar Suthar had access to the youngsters whose dream this was in 1992 during the 2015 World Cup. It seems barely credible that, having been forced to move from a war-torn Afghanistan to a safer refugee camp near Peshawar, three boys could first learn the game with implements which included a shirt for a ball and tree bark for a bat. Innumerable hurdles to overcome may make many wonder about complaining given that these three Afghani boys and others at the time had to deal with the brutality of the Taliban, make dangerous missions to deliver an important letter, try to drum up interest, equipment, facilities and recognition as well as dealing with irate parents desperate for money from their offspring's jobs when they didn't turn up for work. Theirs is a remarkable story. 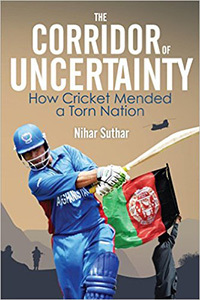 Suthar makes allowances for people who may not have a vast knowledge of cricket. Sometimes his choice of words is not always quite the same as others but equally there are a few points he makes and translations added about everyday Afghan life which are most helpful. Written as a dialogue through the words of the cricketers, he writes in a way which makes for fascinating reading. Taj Malik, Raees Ahmadzai and Karim Sadiq Khan are the main people quoted but another, Allah Dad Noori with his and Taj's considerable differences, is just another sub plot in the drama. Moving on to a time when the dream has almost been realised, the now well-known Mohammad Nabi, had to deal with his father being kidnapped. The story ends with Afghanistan's first World Cup match against Bangladesh in Canberra. In a way it is a fitting place to finish with the dream realised but, equally, it would have been nice to have had the one-wicket victory against Scotland mentioned. And, if the admirable Geoffrey - my teenage cricketing hero - doesn't appear, cricket has unearthed another equally passionate person in Taj Malik. This most heart-warming of stories should be read by not just cricket fans but anyone who believes in good over evil and a triumph for perseverance and determination. Because of the tremendous hardships encountered along the way, it would be wrong to describe it as a fairy tale but, if anyone who reads this sheds a tear, they won't be alone.